Building your blog subscription and email lists is one of the best ways to gather information about qualified leads—people who are interested in the content and services or products you offer. And ensuring they opt-in is crucial—spamming customers and prospects with unwanted emails is never a good thing. DemandGen’s Subscription Center service was created to help you build an effective Subscription Center, to give your prospects and customers and easy way to control what messages and content they receive from you. 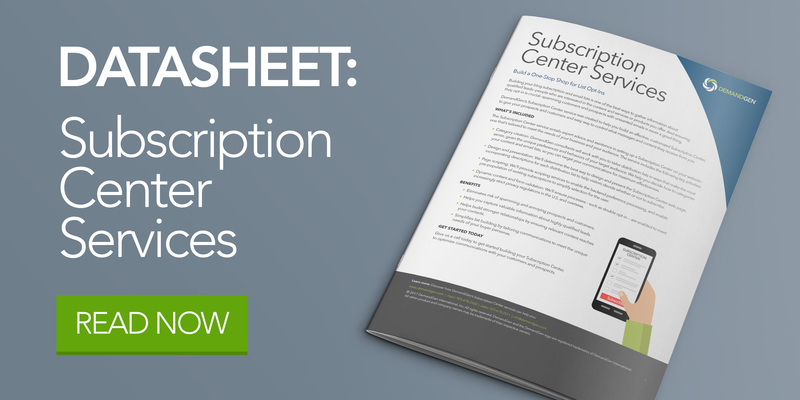 Download our Subscription Center Service datasheet to find out how we can help you build your one-stop shop for list opt-ins.